1. Dig hole and add cement per instructions on the cement bag. Insert galvanized pipe or treated wooden post or redwood post. Use the level to make sure it stays plumb while concrete sets up. Note: The type of soil, total height of weathervane and wind conditions in your area should be taken into consideration to determine how deep the hole should be. If mounting into a galvanized pipe, insert installation rod approximately 10” to 12” (25-30 cm) before stopping at the rivet. Tighten set screws. If mounting into a wooden post, using your level, drill the appropriate diameter hole 7” to 8” (17.5 – 20 cm) down into the wooden post. The hole size will be determined by measuring the widest diameter of your vertical installation rod (see spire photo below). Relatively heavy sculpture pieces (3-D weather vanes, for example) may require a larger diameter installation rod than their swell bodied or silhouette style counterparts. Finally, if the weather vane is to be installed in a high wind location, a mountain top or directly along the coast, we can upgrade the weather vane to a bigger diameter rod to help compensate for occasional increased wind load. 2. For post mounts insert larger end of spire into drilled hole and make sure it reaches the bottom of the hole (some installation rods have a beveled reducer to a smaller diameter). Then confirm that it is vertical using the level. If it is not, use a nail, wooden shim, etc. to make it plumb. 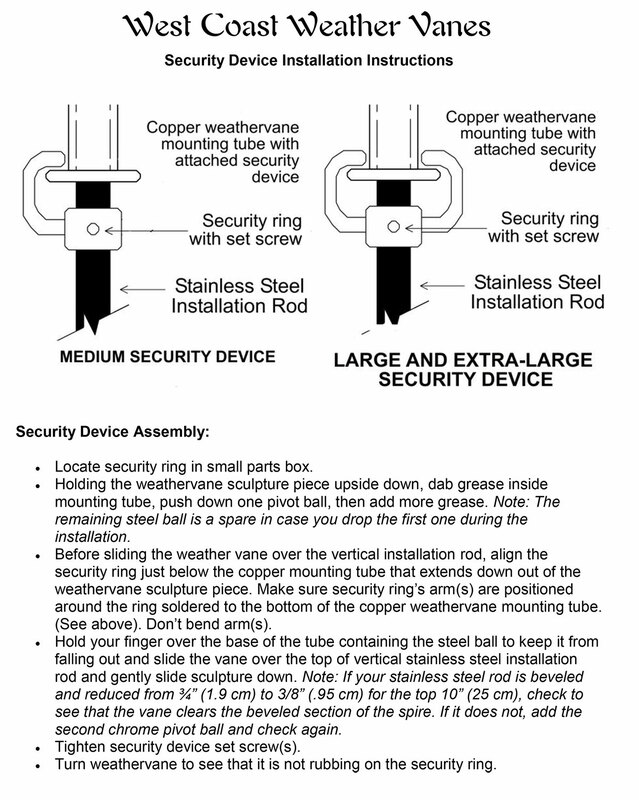 The spire (vertical installation rod) must be exactly vertical for your new weather vane to spin freely. Note: the rod itself does not turn, only the sculpture piece. NEVER TUG OR PULL ON SPIRE (vertical installation rod). 3. Caulk around secured spire (vertical installation rod) to seal the hole. 4. Assemble ring, globes and directionals on the spire (vertical installation rod). Slide brass ring on spire. Allow it to slide to bottom. Do not tighten yet. Slide on large globe. Allow it to gently slide to the bottom of the rod. Do not tighten yet. If spire/rod does not have a beveled reducer to a smaller rod, slide on the second brass ring and slide down to rest on directionals. Do not tighten yet. Note: If rod is reduced in diameter at the top, disregard this step. Carefully slide on the smaller copper globe. Note: If installed rod is a smaller diameter at the top, your small copper globe will have larger and smaller diameter holes drilled into it. Position globe so larger holed end slides on first. The small hole will come to rest on the beveled section of the spire rod. Note: Some weathervane designs come with the smaller copper globe attached to the sculpture piece. If this is the case with yours, skip last two steps above. 5. Coat the section of the spire (vertical installation rod) that will be covered by the vane sculpture piece with grease. (Use small tub of grease included with weathervane). Note: The security device is physically attached to the weathervane sculpture piece and must be added at the time the weathervane is being constructed. It cannot be added after the weathervane has shipped. Locate security ring with set screws, in small parts box. Insert ONE chrome pivot ball into the mounting tube at the base of the weathervane sculpture piece, as illustrated above center. Note: The remaining steel balls are spares in case you drop the first one during the installation. Hold your finger over the base of the tube containing the steel ball to keep it from falling out and slide the vane over the top of spire (vertical installation rod) and gently slide sculpture down. Note: If your stainless steel rod is beveled and reduced from ¾” (1.9 cm) to 3/8” (.95 cm) for the top 10” (25 cm), check to see that the vane clears the beveled section of the spire. If it does not, add a second ball bearing and check again. Tighten security device set screws. Spin weather vane to see that it is not rubbing on the security ring. 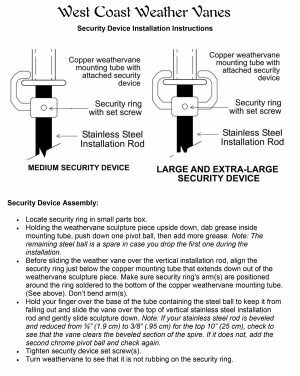 Before sliding the weathervane over the vertical installation rod, align the ring inside the two security device copper loops. Insert ONE chrome pivot ball into the mounting tube at the base of the weathervane sculpture piece, as illustrated above. Note: The remaining steel balls are spares in case you drop the first one during the installation. Hold your finger over the base of the tube containing the steel ball to keep it from falling out and slide the vane over the top of spire (vertical installation rod) and gently slide sculpture down. Note: If your stainless steel rod is beveled and reduced from ¾” (1.9 cm) to 3/8” (.95 cm) for the top 10” (25 cm), check to see that the vane clears the beveled section of the spire. If it does not, add a second ball bearing and check again. 7. Insert ONE steel ball into the mounting tube at the base of the weathervane sculpture piece. (The remaining steel balls are spares in case you drop the first one during the installation.) Hold your finger over the base of the tube containing the steel ball so it does not fall out and transfer the vane over the top of spire (vertical installation rod) and gently slide sculpture down into place. Note: If your stainless steel rod is beveled and reduced from ¾” (1.9 cm) to 3/8” (.95 cm) for the top 10” (25 cm), check to see that the vane clears the beveled section of the spire. If it does not, add a second ball bearing and check again. 8. Now slide harness components resting at bottom of rod (as detailed in #4 above) up into place and tighten with a screwdriver. See image below for suggested vertical positioning. Use your compass to orient the brass directional letter N to true north. Depending on how accurate you want your Directionals to be, please see our Magnetic Declination webpage for details on how to precisely orient the directional letters.